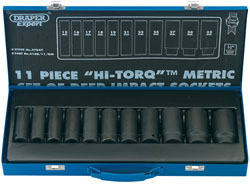 Expert Quality, Draper Expert HI-TORQ® 6 point deep sockets 78mm long, forged from chrome vanadium steel hardened, tempered and chemically blacked for corrosion protection. Hole for accessory spring loaded ball. Packed in steel carrying case. Contents: 15, 16, 17, 18, 19, 21, 22, 24, 27, 30 and 32mm.